The three performers sit on stationary bicycles, pedalling throughout the show. Noah ‘The Flying Shamrock’ (Jonny Holden) is a complex and charismatic pro-cyclist from Ireland. Tony (Tim Chipping) is the hapless, loving father of Jodie (Harriet Slater,) a bright and determined sixth-former. Tony buys his daughter a bike. She’s hooked, and then Tony gets hooked too. 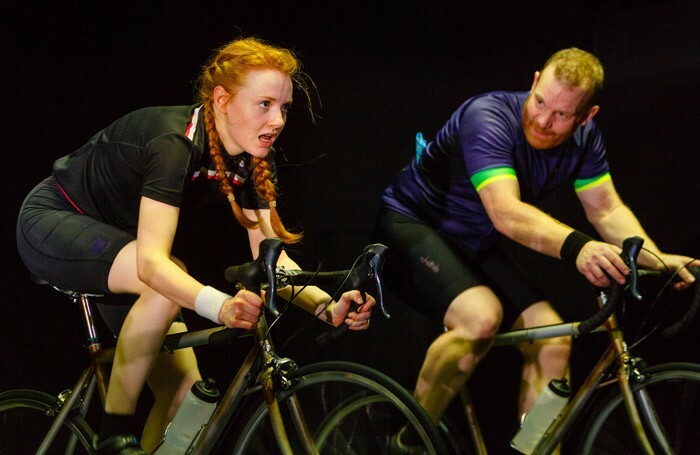 Phil Porter’s new play, produced by the Theatre Royal, maps the peaks and valleys of this father-daughter relationship as well as Noah’s journey through fame and professional cycling (including his relationship with drugs). These two strands are brought together in a surprising and potent way and bolstered by the play’s unique staging, the actors all on bicycles. The constant cycling brings a relentless pace and visceral quality to Justin Audibert’s production; whatever happens they must keep moving forward, no matter what. It’s an eloquent metaphor for life (as is the image of Tony struggling to keep up with his daughter), cleverly layered through Porter’s frank and compelling play. The Man with the Hammer is about why we cycle; it’s about adrenaline, escapism, and endurance. But Porter also casts an empathetic, extensive eye over the complex issues of addiction, the reasons why people cheat, why they lie and hurt others. Powerfully written and performed, evocatively lit and inventively directed and designed, this is a propelling production which will appeal to cyclists and pedestrians alike.